Books fall open, you fall in, delighted where you've never been; hear voices not once heard before, reach world on world through door on door; find unexpected keys to things locked up beyond imaginings. What might you be, perhaps become, because one book is somewhere? "I've thoroughly enjoyed the experience of tutoring. It's a wonderful feeling to know I've had a positive impact." "I'm not really an outgoing person, but when I came to Literacy Volunteers, I fell in love with the place and the people. It's become a real passion in my life." "It's great to see a student come here with goals and then go on a path of discovery to reach them, step by step. It's an amazing process of self-directed learning." "Working with my student has been a joy. I have learned so much from him and his determination to move forward and improve his reading skills. It's so rewarding and enriching to see another person grow in these ways and to be a small part of it." "Don't waste a minute in signing up to be a Tutor!" How long will it take to improve my reading? Many things affect how long it will take to improve your reading or writing. Everyone learns differently and some people have more time to practice between sessions. After you go through your initial assessment and begin tutoring, you will have a better understanding of how long it will take you to reach your goals. I have a high school diploma, but I don't read or write well. Can you help me? Yes. You are not alone. Many adults have a diploma but still have trouble reading or writing. We will work with you to reach your goals. What will happen after I call you? First you will come into our office so that we can learn more about your goals and what you already know. Then we will find a tutor who will be a good match. After that, you and your tutor will create a schedule and begin working on your goals. I didn't do well in school. Why will this be different? Literacy Volunteers of Greater Sanford is a student-centered organization. We train volunteers to work with you one-to-one on your goals and to use books and other materials to help you achieve your goals. You decide what your goals are and your tutor will help you reach them. Our services are free of charge. We receive funding from the United Way, foundations, community members and businesses to provide our services. What if I don't want anyone to know that I have a tutor? We do our best to make a good match for every student, but if a tutor-student match is not working, we will try to make a new match. If you have any problems, call our office and we will help. I just need a tutor to help me get my permit or pass a test. Do you help people with short-term goals? Yes. Many of our students come to us for help getting their driving permit, Commercial Driver's License, Citizenship or another goal. Once you reach you goal you can stop your lessons or you can decide to work on a new goal. I don't speak English. Can you help me learn English? Yes. We have tutors who are trained to work with people who are learning English. How did Literacy Volunteers get started? In 1962, Ruth J. Colvin founded Literacy Volunteers of America in New York state. Affiliates were created throughout the United States. There are 14 affiliates in Maine. In 2002, Literacy Volunteers of America and Laubach Literacy International merged to form ProLiteracy, an international organization dedicated to improving literacy skills throughout the world. You can learn more at www.proliteracy.org. How can I donate to Literacy Volunteers? Literacy Volunteers relies on the support of the community. If you would like to make a tax-deductible donation, please send it to our office or go to the Donate box on the home page. Thank you. How many Literacy Volunteers affiliates are in Maine? There are 14 affiliates in Maine. 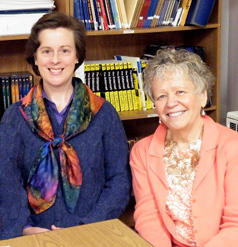 They work together to improve the literacy skills of adults throughout the state. I was trained to be a volunteer tutor in a different affiliate. Do I need to take your training if I want to volunteer in your affiliate? We recognize the training of affiliates so usually we do not ask volunteers to repeat the training. Sometimes volunteers repeat the training as a refresher to brush up on their skills. I'm interested in working with people learning English, but I don't speak any other languages. Can I still become an English for Speakers of Other Languages (ESOL) Tutor? Yes. During the ESOL Training you will learn techniques for working with a person learning English. You do not need to speak any other languages to help someone learn English. In addition to tutoring, what are my responsibilities? You will need to plan your lessons, keep a record of your hours and assess your learner's progress. All of our tutors complete a Tutor Training class. We have two types of classes: Adult Basic Literacy and ESOL. We will also ask you to complete a Volunteer Application. I want to volunteer, but tutoring isn't for me. Are there other volunteer opportunities? Yes. We have many volunteer opportunities. Please contact our office to learn more. Both tutors and students occasionally have other commitments. Each learning pair works out the logistics of holidays and vacations. If you will be away for an extended period of time, please contact the office so that we can make arrangements for another tutor to work with your student. What if I need help planning my lessons or helping my student make progress? After you complete the Tutor Training, you will have a lot of tools available to you, such as the Tutor Workshops, other tutors, and the staff. Please be in touch with the office and we will help. See the Tutor Resources page as well. I am not a teacher. Can I still be a tutor? Absolutely! During your Training, you will be given the tools and strategies needed to effectively tutor an adult learner. After you begin tutoring, we will be available to support you. What type of time commitment do I need to make as a tutor? We ask that our tutors commit to volunteering for 2 hrs. a week for at least one year.